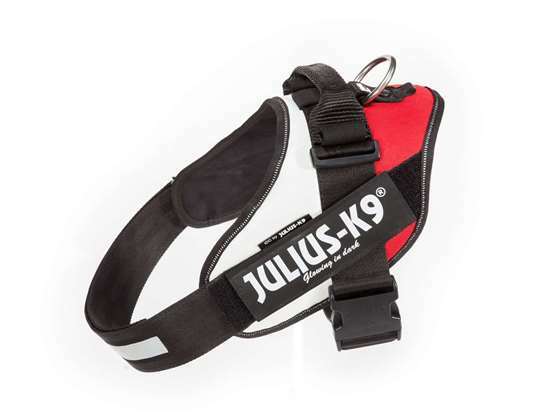 Polish flag Julius-K9 IDC® harness, Size 2 - Las Vegas K9 Inc. The multi-colored dog harnesses are extremely cool-looking, and at the same time represent the usual high quality of Julius-K9 IDC® Powerharnesses. Ergonomic and sporty design, breathable liner – means comfort for your dog. With heavy duty buckles and wide, strong chest strap for the optimal stability. The reflective seam edges, chest stap and the fluorescent labels give perfect visibility for the night walks and sport activities. Thanks to the special colors and the great variations of the labels your harness will be renewed every day. If you order more than 20 harnesses, we will make your personal variations.